I didn't have my camera, so these are Sandhill Cranes off the internet to give you an idea what a crows of cranes looks like. 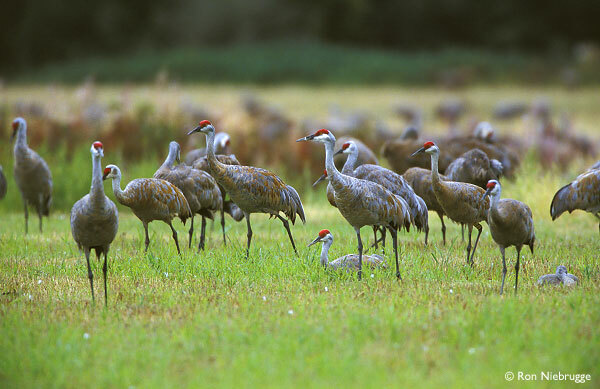 So I was driving down to the cabin last night when I realized that all those grey things in the field next to the East River Road weren’t deer, they were Sandhill Cranes! There were scores of them — I’m notoriously bad at that sort of estimation, but there were well over a hundred birds in a harvested wheat field, grazing. I’d heard that they do this, but I’d never seen it, so of course I came to a screeching halt to watch for a few minutes. Apparently they gang up before migrating, they’ll fly around, calling to the other birds and gathering everyone up. Then when the time is right, they’ll ride the thermals way up and shoot south over Yellowstone. We were hoping to see it this morning, but it’s snowing again, which is lovely, but hardly the sort of weather to transport hundreds of five-foot-tall birds into the sky. When I drove back up the valley this morning they were still there, not as many, and with a bunch of Canadian geese, and a few mule deer hanging out as well. It was amazing. The kind of thing that makes me love living here. I got to the cabin so jazzed about the cranes. I mean, I live here — this is the kind of thing I can just see on an ordinary evening’s drive down valley. It makes me feel more grateful than I can even say. Love it. All I see here are scores of silicone implants.